Dogs have been used by law enforcement for hundreds of years. This new Maxpedition patch illustrates the preferred breed of the modern police officer: the loyal German Shepherd. 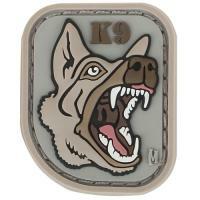 Demonstrate support for K9 units by wearing the fierce German Shepherd Patch patch on any Maxpedition bag. The patch is made from durable PVC rubber for lasting service life. The item can be added to any accessory with a loop field, or by stitching on the additional loop field sheet to gear for ultimate customization. Maintenance is made simple with ordinary soap and water. Oval Badge - A4684 - 3 3/8" x 2 1/2"